This is an Advertorial blog for The Mile Farm Shop. The Mile – Farm Shop and Smile Café is a family owned and run business in Pocklington, specialising in showcasing top-quality produce from local Yorkshire suppliers and delivering a top-quality service. Located just a few minutes from Pocklington town centre – on The Mile (a road which heads towards the East Coast) – it is perfect for families, ramblers, cyclists, shoppers and dog walkers. Here’s our six favourite reasons to visit The Mile – Farm Shop in Pocklington. From afternoon cream teas and homemade fruit cake to full English breakfasts and homemade soups, Smile Café has a brilliant menu to suit adults and children throughout the day. There’s a fantastic choice of seating areas, including a child-friendly play cafe, a pet-friendly Farm Shop seated area and outside sofas and tables. And, all served from a kitchen rated 5/5 by food hygiene inspectors. 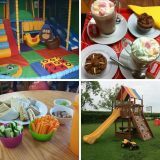 There’s a wonderful indoor children’s soft play area aimed at under 5s, with double slide, mats and building toys, plus an outdoor play area with climbing frame, swings and ride-on toys. 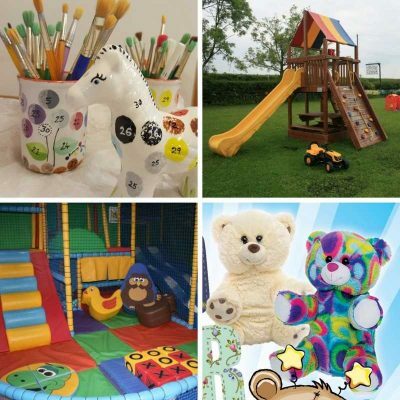 Smile Café regularly caters for children’s birthday parties, and older children can also indulge their creative sides with Paint-Your-Own-Pottery and Be-my-Bear parties. From greeting cards featuring local Yorkshire artists to specialist booze from local breweries – or from pet toys and chews to handmade sweets from local confectioners – The Mile – Farm Shop is the perfect place to shop for unique gifts for all the family, including pets! There’s even a photo printing service for canvases and photographs. Whether it is gin made from Yorkshire water or bread baked from flour that’s milled nearby, The Mile – Farm Shop has a lovely food and drink range. Fodder on offer includes fresh fruit & vegetables, fresh eggs, superb cheeses from local farmers, hams and pizzas. Shelves host a large range of chutneys, pickles, jams, oils, sauces, pates, condiments, cereals, cakes and biscuits, too. The Mile-Farm Shop Camping Site is open all year round and welcomes caravans, tents and motorhomes to its flat well-drained pitches. Facilities include ectrical hook ups, wash outs for chemical toilets, Wi-Fi broadband, toilets and showers. The Mile – Farm Feed Shed offers a wide range of pet, horse and poultry supplies, including horse feed, supplements, hardware, bedding – as well as small bales of good quality hay and straw. There’s also essentials for dogs, cats and small animals, including feed and bedding. Plus, you’ll also find wheelbarrows, buckets, BBQ coals, gas and kindling. Oh, and there’s a key-cutting service, too. The only thing missing… the kitchen sink! I go to The Mile frequently with my 2 little ones. We meet friends with little ones who live in York there as its about half way between York and Hull, or it makes a good stop off if we’re going to do something in York. I love that all the food is home cooked and you can go early for breakfast too. It’s also great when you’re not sure about how the weather will turn out as it has the indoor soft play or the outside climbing frames and toys. For more information please call Jo on 01759 305420, email info@themilefarmshop.co.uk, or check out their website here or their facebook page here.